Bible Questions, Christian Living, Christian Theology, Misc. Does a Christian Have to be a Member of a Local Church? A few terms must be adequately clarified to answer this question. The first term to define is “Christian.” This word does not mean the same thing to everyone. To some, it may be a way of defining themselves as not belonging to other groups. For example, one may think of themselves as not Jewish, or not Muslim, or not an atheist. Having been raised by Christian parents in a Christian home, they would consider themselves “Christian.” For them, it is a category like “Caucasian,” “middle-income,” or “American. But, to answer this question I am going to use a more radical definition of the term. I will define Christian as the Bible defines it: a disciple of Jesus. That is – a person who adheres to, or follows the life and teachings of Jesus. Jesus said, “if you continue in my word, then you are truly disciples of Mine,” (John 8:31). The second term to define is “member.” For many (probably most) modern churches in our country, this term means that a person has taken some type of vow or pledge to a local organized church group. The pledge generally means that they will support the organized church with their presence, talents, and financial support. Their name is then generally recorded on some sort of membership roll. For many churches, one cannot be considered as a leader, or hold a church office, unless their name appears on the roll. 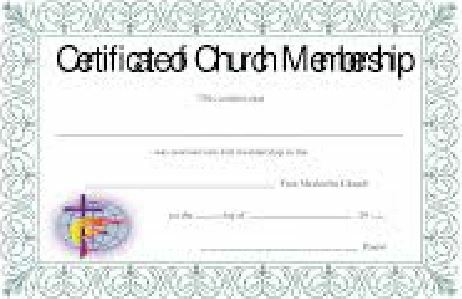 Almost all local organized church groups consist then of those whose names appear on the membership roll – and those who do not. The Bible does not command us to keep membership rolls, nor does it forbid it. In my opinion, there is nothing inherently wrong or right about it. It can, however, lead to some problems. For example, many churches carry members on their rolls who do not keep their pledges, or who may openly live in sin. I know of a case where the person whose name is on the roll didn’t even claim to be a Christian! Imagine that – a non-Christian as a member of a Church! Having non-Christians as members, or members who openly live in sin serve can only to shame the Body of Christ as a whole. Another problem with this type of membership is that people often see themselves as a member of one body of believers, but not a member of another. In other words, people see themselves as belonging to this group of Christians, but not that group of Christians. The Bible nowhere encourages this type of division. On the contrary, it discourages it (see 1 Cor. 1:11-13). Finally, another problem with membership rolls is that it can unfairly divide the local assembly. For example, someone who faithfully attends a local church but has not felt led to place their name on the roll might not be allowed to cast a vote on matters of importance or participate in leadership positions. This is because many assemblies do not permit non-members to participate in these activities-even if they are more active than members. They reserve these privileges only for those who have taken the pledge; sometimes regardless of their lifestyle or weekly participation in church. So, how do we understand being a “member?” The New Testament indicates that if we belong to Jesus, then we are members of His body (Eph. 5:30). Anyone who is a disciple of Jesus is automatically a member of the universal Church. The New Testament also seems to recognize that Christians living in a certain area were part of that local area’s church. For example, Paul wrote to “the church in Corinth,” or “to all who are in Rome.” Evidently one was a member of the church that was local to him or her. However, it is doubtful that they were members of those churches in the same sense that we think of membership today. They were likely members simply because they came together for worship, fellowship, and instruction. So, now to answer the question: Does a Christian have to be a member of a local church? Neither Jesus nor any New Testament writer instructed Christians to take vows or pledge themselves to a local body of believers, nor for leaders to record the names of those who did. It might be fine to do so, but I do not see it as essential. On the other hand, Christians need to see that they are part of the body of Christ and that when the body comes together, Christ is present (Matt 18:20). A follower of Jesus should need no instruction to be gathering with other Christians for worship, fellowship, and instruction. It should be a natural outgrowth of his or her relationship with Jesus. In my opinion, any person who claims to be a Christian, yet does not seek out the fellowship of other Christians, has very serious spiritual growth problems. Get to church. Let God lead you in regards to becoming a member. Posted in Bible Questions, Christian Living, Christian Theology, Misc. I Can Never Forgive That Person!